Cress took longer for me to read then the first two books…because I got sick and didn’t feel like reading. My son is also sick, so with us both being sick there wasn’t any time to read. But I did love this book. It was just as amazing as the first two, and I regret reading it right after the second and not waiting a little bit because now I can’t wait until November for the next book. And my luck, my husband is going to want me to wait until Christmas. I guess I just have to get Fairest to hold me over. The new character, and the title one at that, is Cress. A 16 year old Lunar Shell who has lived in and imprisoned on a satellite in space for the last 7 years. And the 11 years before hand she lived on a compound with other Lunar Shells on Luna. She has been hacking radars and helping Levana and Sybil spy on Emperor Kai. Recently she has been watching the newsfeeds about things related to Cinder and Thorne, who she has developed a massive crush on. Cress has been waiting for Cinder to contact her again using the D-COMM chip like before. And she finally does. They come up with a plan to come rescue Cinder. And it’s going great. Until Sybil shows up. Unexpected. 45 minutes before Cinder and the crew is supposed to arrive. Cress almost gets away without her finding out, but Sybil sees a message from them on the screen. That’s when things go bad. Sybil ties up Cress, poses as her to Thorne. Steals his podship while disabling the satellite sending it hurtling to Earth. Sybil, along with her guard Jacin, go to the main ship with Cinder. There is a fight. Wolf gets shot. Scarlet gets captured. And Jacin is now part of the Cinder crew. Cinder takes her crew to the town where Dr. Erland said he would be, so they can get Wolf the help he needs medically. Cinder believes that Thorne is dead. Who wouldn’t? He fell to Earth on a satellite from space. Come on. While this is going on, Prince Kai is preparing to marry Levana and have all control taken away from him. Miraculously Thorne and Cress live. They travel across the desert. Thorne has become blinded from the fall. Cress almost dies because she doesn’t have shoes. Eventually they run into a caravan selling goods and they help Cress recover. Except they aren’t good people. Once they get to a town they kidnap Cress and take her to….Dr. Erland! Right. What a coincidence. Thorne goes after her. Cress saves herself by hitting Dr. Erland in the jaw. The military finds Cinder and them, they actually escape. Iko gets a new body. The devise a plan to kidnap Kai on the day of the wedding because he is needed for Cinder to go to Luna and start a revolution. I love Cress. I think is just the sweetest most amazing 16 year old there is. I mean. Yes. Cinder is also 16. But come on. Hacker is a pretty awesome thing to be at 16. I love her relationship with Thorne. I love how he realizes how much he cares for her as time goes on. This book was just so good. No lull in plot. Very fast paced. This is an amazing addition to an amazing series. 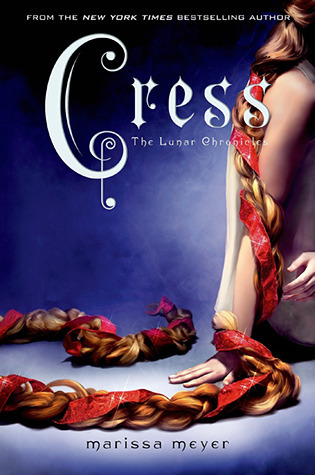 This entry was posted in Book Review and tagged book, book review, book reviewer, books, cress, lunar chronicles, marissa meyer, review, reviewer. Bookmark the permalink. I’m re-reading this series right now and am currently on Cress. I love this series so much. I think each book gets better and I’m so excited for Winter. They do. They really do. And I’m so excited too!